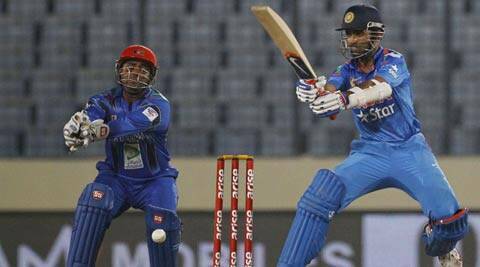 Ajinkya Rahane, opening the innings, scored 56 runs in an easy chase of 160 against the Afghan unit. Ajinkya Rahane played the role of an opener against Afghanistan but the Indian batsman wants to perform well in the upcoming Twenty20 World Cup while batting at number four, a batting position he finds more challenging. Rahane scored 56 runs and added 121 runs with fellow opener Shikhar Dhawan in an easy chase of 160 against the minnows. “As an opener, you get first 10 overs, and new ball. I like to back my instincts and play my shots. At No 4, sometimes situation is like 30 for 2 or 40 for 2 and sometimes it’s like 120 or 150/2. You have to play under different situations when you bat at No 4. It’s very crucial to rotate the strike and play your shots, back your instincts. No 4 is really a challenging position,” Rahane told reporters. “In T20 and domestic, I used to open. I am learning a lot at No 4. With world cup coming up, I’m looking forward to this challenge,” he added. Pakistan’s win against Bangladesh on Tuesday had already sealed India’s fate in the Asia Cup. They signed off with a comfortable eight-wicket win over Afghanistan with 106 balls to spare. Rahane said they missed skipper Mahendra Singh Dhoni but added that stand-in skipper Virat Kohli did a great job. The team will fly out of Bangladesh on Thursday before returning here for the World Twenty20 in less than a fortnight’s time and Rahane said their experience here has prepared them well.